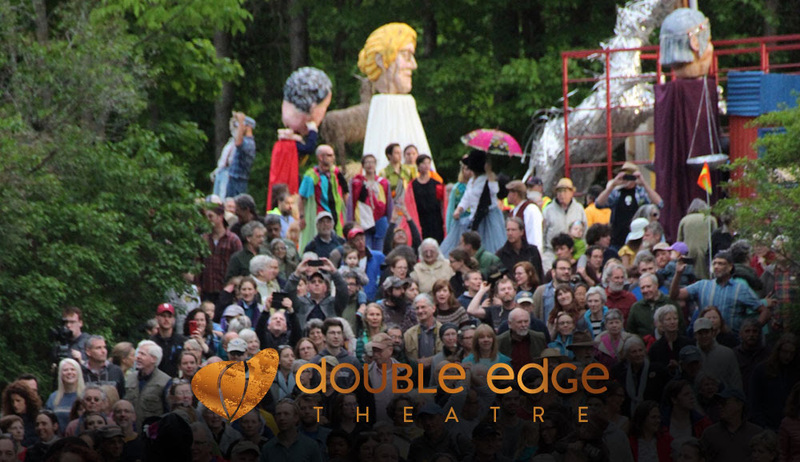 Each year, Double Edge Theatre welcomes thousands of spectators to its Farm in Ashfield, MA to experience its Indoor/Outdoor Traveling Summer Spectacle. Over the past sixteen years, this annual performance has become an iconic, must-see summer event in Western MA. Double Edge’s 2018 Summer Spectacle will be a new imagining of We The People, the theatre’s 2017 Spectacle, which ran for three weeks last year, and was sold out before opening night. We The People has its roots in Double Edge’s thirty-six-year pursuit of the paradoxes, stories, and dreams that make up a human being, a community, a society. The audience will experience the beauty of the hills, pastures, and gardens of the Farm surrounded by music and flight, weaving through different paths toward a culminating grand scene. Through this work, the artists of Double Edge examine how to define evolving communities, beyond what is dictated by the loud and often overpowering voices and forces of society. The audience will walk freely between intimate installations where characters from nature, history, and imagination create and inhabit lyrical, integrated worlds. We The People is a traveling rumination on finding freedom through creativity, a profound relationship with the land, and a curiosity and reverence for past generations. The audience will travel in small groups among the fields, flowers, waterways, barns, forests, and secret paths of Double Edge’s blooming, verdant Farm. Birds fly above, transforming to human form as they gently land; citizens emerge from the past to recount their stories - a farmer, a scholar, a poet, an immigrant, a suffragist, and more - a legacy of freedom shared through the vital voices of those who resisted social and political oppression; enormous creatures appear from the trees and spring up from the water; a woman’s voice is heard, her song of longing floating on the wind. History, magic, and music are woven together to create an allegorical tapestry, the audience invited to wander among these fantastical, interlaced worlds. What are the hidden territories of the land, of history, and how do they speak to us as citizens in the present moment? This summer, Double Edge attempts to articulate the beauty of the environment, uncover lost voices, and joyfully inhabit a world of wild imagination. Double Edge Theatre, an artist-owned organization, was founded in 1982 by Stacy Klein. The ensemble applies vigorous physical training and the principle of an artist’s autonomy to create work intimately woven with the community. In 1994, Double Edge moved from Boston to a 105-acre former dairy farm in rural Ashfield, MA, to create a sustainable artistic home. In 1996 Argentine actor, puppeteer Carlos Uriona joined DE and wove into the ensemble his community-based street theatre. Today, the Farm has become an International Center of Living Culture, including performance, international touring and artist collaboration, year-round theatre training, conversations, convenings, greening and farming initiatives, and a popular indoor-outdoor traveling spectacle which takes place alongside the hills, pastures, river, and gardens of the Center. Double Edge Theatre creates performance cycles based on identity, including the Women's Cycle, the Song Trilogy, the Garden of Intimacy and Desire, the Chagall Cycle, and the Latin American Cycle, an exploration of the artistic acts, culture, and magic realism of societies of struggle and dictatorship. This fifth cycle includes Cada Luna Azul, which premiered in 2015 at DE’s Farm, and Leonora and Alejandro: La Maga y el Maestro, which premiered in March 2018 at Peak Performances at Montclair State University.